Museum Director Michael Smith shows off the SpaceShipOne RC Test model in front of its exhibit case. The National Model Aviation Museum is thrilled to announce its exhibit of the SpaceShipOne RC test model. This piece of aerospace history is significant because it proved the viability of an experimental, nongovernment-funded concept and was flown in front of pilots who would later fly the full-scale aircraft. In 2004, SpaceShipOne became the first privately built and operated vehicle to achieve manned supersonic spaceflight. The purpose of the program was to accelerate the development and reduce the cost of spaceflight, specifically for commercial passenger use. The aircraft was later retired and is on display at the Smithsonian National Air and Space Museum. Designed by Burt Rutan, SpaceShipOne was unique in its application of a “feathering” re-entry system. The rear half of the wing and the twin tailbooms fold upward along a hinge running the length of the wing, increasing drag while remaining stable. 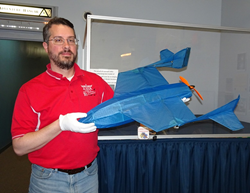 The model is currently on display at the National Model Aviation Museum at AMA Headquarters in Muncie, IN. To learn more about the museum and its collection of more than 11,000 model aircraft artifacts, visit http://www.modelaircraft.org/museum. The Academy of Model Aeronautics, founded in 1936, continues to be devoted to national airspace safety. It serves as the nation’s collective voice for approximately 188,000 modelers in 2,400 clubs in the US and Puerto Rico. Headquartered in Muncie, Indiana, AMA is a membership organization representing those who fly model aircraft for recreation and educational purposes. For more information, visit http://www.modelaircraft.org.